My Sewn In Hair Extensions? "How do you was sewn in hair extensions (not glue in extensions)?" Washing sewn in hair extensions is a lot easier than washing glue in hair extensions (or should that be cleaning as technically there's no water involved). Hair weave maintenance is divided into three areas; daily styling products and tools for sewn in hair weave, washing weave hair and of course caring (nourishing) which includes conditioning. This article outlines the cleansing products (shampoos and conditioners) for sew-in hair weave as well as the washing methods that can be used. Hair washing (whether the hair is on a wig, hair extension, or growth hair) is about removing oil (sebum) dust, or styling products from the surface of the scalp, hair and from between the hair strands. In other words, you, your hair and your scalp will all be better off if you're gentle when washing. Washing sewn-in hair weaves means getting between the tracks and getting your whole head wet. If you like lots of detail then check out the step-by-step guide to washing sew-in hair extensions - yes it's aimed at curly heads, but the principles apply to straight and wavy sew in weave heads too, otherwise stay right here and read on. Mix your chosen cleansing agent with some warm water in a spray or applicator bottle and set aside. 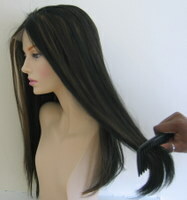 Detangle with fingers when hair weave is dry - start at the ends and work up to the tracks. Use a wide tooth comb and start combing from the tips of the hair working upwards to the tracks. Separate each of the tracks and apply the shampoo and water mix between each track and your edges. Gently massage into your growth hair. Apply the cleanser and water mixture to your hair weave until it's saturated. Comb from the tips up to the tracks using a wide tooth comb. Rinse and use your fingers to gently massage in between tracks as you rinse. Repeat until cleansing agent is removed. Repeat from step 4 if you think the hair is not clean. After the final rinse, squeeze the hair to remove excess water; start at the top and work towards the ends. Whilst your weave hair extensions are still dripping, use a wide tooth comb and starting at the tips, work upwards to detangle. Dry your hair. If you have curly sew in hair weave, it's better to leave it to air-dry so that the curl pattern can fully reshape and return. Any ordinary shampoo, or conditioning shampoo can be used and if it's possible use one that doesn't Sodium Lauryl Sulphate or Sodium Laureth Sulphate - these ingredients are quite harsh for your own growth hair (further info about SLS and SLeS can be found at http://cincovidas.com/is-sodium-lauryl-sulfate-from-coconut-safer-than-regular-sls/). Clarifying shampoos can also be used but ideally no more than once a month. Their super cleaning abilities are down to the fact that they contain more cleaning agents (surfactants) than ordinary shampoos. However the downside to this is that if they're used frequently, they can cause your dyed sew in hair weave to fade more quickly. Ta-dah! That's your lot for washing sewn in hair extensions, but your guide to caring for sew in hair extensions isn't over yet, there's still the issue of nourishing your sewn in hair extensions with oils. If you want to keep up to date with the next guide about hair weave, wigs, hairpieces and hair extensions, then why not join our blog.